When it comes to food, I may be a purist, but I just can’t seem to muster up the ambition to roast and pulverize my own sugar pumpkin, and I think grinding my own peanut butter just might be more expensive than buying it in the store. These are two things I can and should do. But I probably won’t; therefore, I have no right to complain, especially when I have food on the table. 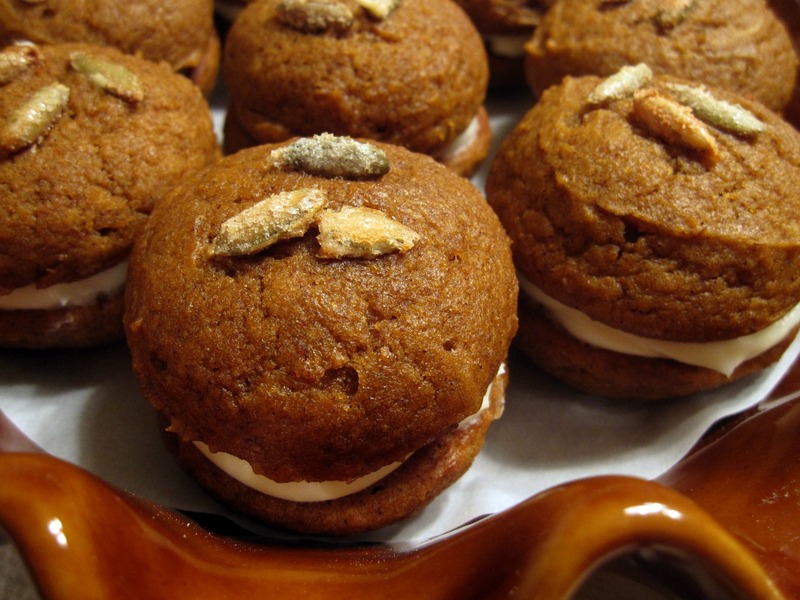 So instead, while I cross my fingers and hope that I can turn out a pumpkin pie by this Thanksgiving, I thought I’d share one of my favorite pumpkin recipes with you: Pumpkin Whoopie Pies. 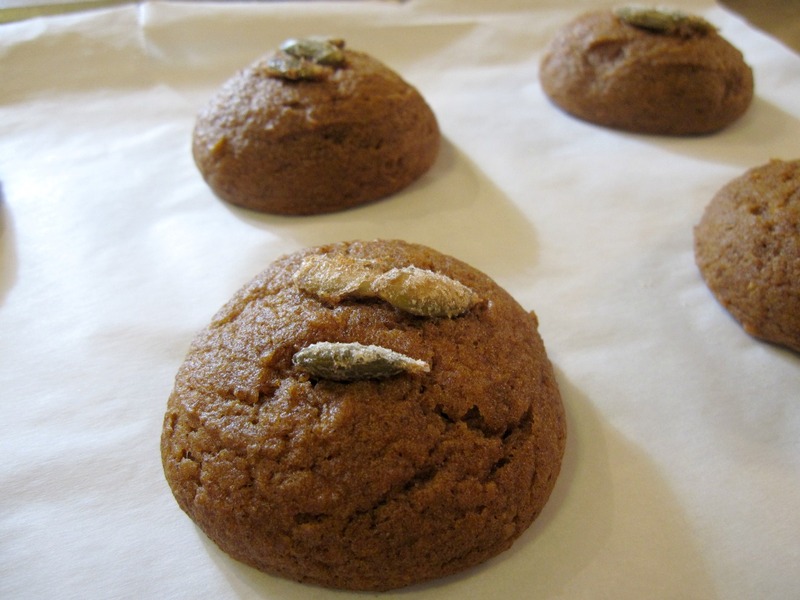 These pint-sized pumpkin treats come from Baked: New Frontiers in Baking. The whoopie is a traditional New England dessert (sorry if any PA folks are reading — doubtful), and I do have a penchant for all things homey and of Northeastern origin, but I don’t really love the traditional chocolate sandwich. Matt Lewis and Renato Proliafito echo similar sentiments in the recipe. My mom introduced me to the whoopie pie at a local Italian bakery when I was very young. It was practically pub burger-sized, and I left it to her after one bite, something I rarely did. The cakes I’ve come across are often too sticky and moist on top or too dry, tasting like a Devil Dog, a packaged cake I hated as a child. The filling is usually made with shortening or marshmallow cream, the former being flavorless and tacky, the latter being overly sweet. 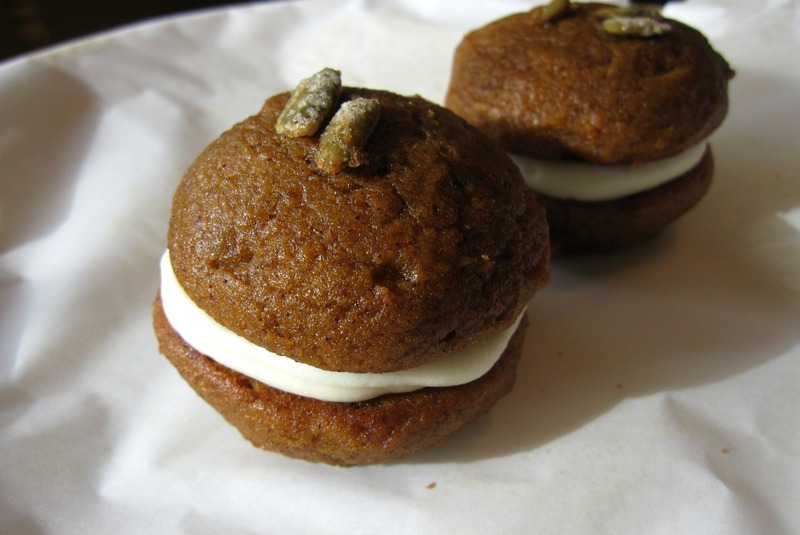 A pumpkin whoopie pie, though, was something I could get into. I first had one (before they got so popular) a few years back at Henrietta’s Table in Cambridge. While not transcendent, the cake was surprisingly light, and I loved that they were filled with a fluffy cinnamon whipped cream. And they were petite. I don’t necessarily go gaga for dainty desserts, but who wants a giant cake sandwich? The Baked version is really a whoopie pie hater’s whoopie pie. Cloves, cinnamon, and ginger is measured in tablespoons, not teaspoons, but the cake/cookie has a perfectly balanced flavor, and the pumpkin is not at all outshined. I liked that dark brown sugar is used instead of granulated sugar, as it gave the cake that hint of molasses flavor that is so welcome during the fall. As with other spiced desserts, cream cheese filling provides the perfect tang to offset the warm flavors. The recipe calls for the pies to be chilled, which I thought I wouldn’t like, but once I tasted one, I couldn’t eat it any other way. Before baking, I topped mine with some pepitas that I candied. Even after a few days, they never got that sticky top. They’re the perfect Halloween treat, and I fully endorse using some of that precious pumpkin supply on them. I found the recipe in Baked: New Frontiers in Baking, by Matt Lewis and Renato Proliafito (remember the Sweet and Salty Cake?) but is is also posted here. Use a small ice cream scoop with a release mechanism to drop heaping tablespoons of dough onto the prepared baking sheets, about 1 inch apart. Bake for 10 to 12 minutes, until the cookies are just starting to crack on top and a toothpick inserted into the center of a cookie comes out clean. Let cool completely on the pan while you make the filling. Sift confectioner’ sugar into a medium bowl and set aside. 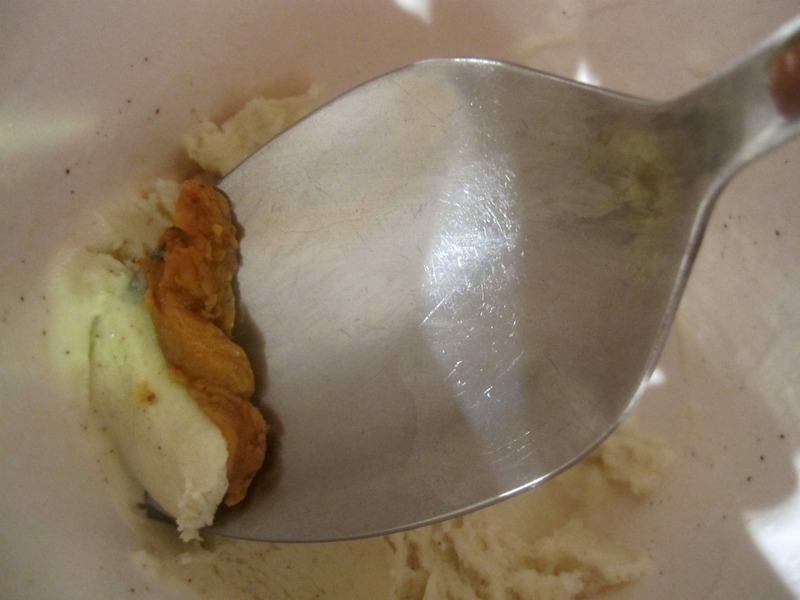 Use an ice cream scoop or a tablespoon to drop a large dollop of filling onto the flat side of the cookie (I used a disposable pastry bag and piped the filing). Place another cookie, flat side down, on top of the filling. Press down slightly so that the filling spreads to the edges of the cookie. Repeat until all the cookies are used. Put the whoopie pies in the refrigerator for about 30 minutes to firm up before serving. The whoopie pies will keep for up to 3 days, on a parchment-lined baking sheet covered with plastic wrap in the refrigerator. *Baked Note: Make sure you chill the pumpkin puree thoroughly before making this recipe. The chilled puree will make your whoopies easier to scoop and give them a domed top. I’ve made the Henrietta’s Table ones. They’re my favorite! But these sound (and look) really good too! These look so pretty! 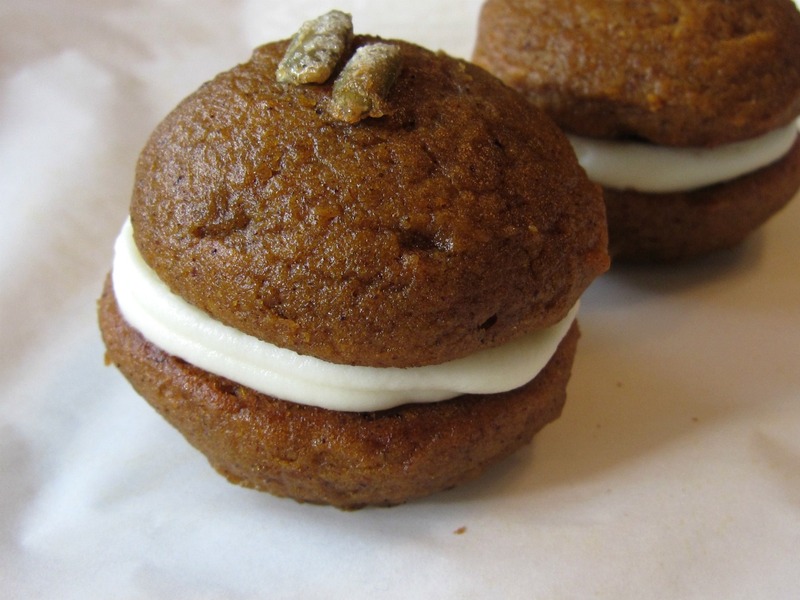 I had pumpkin whoopie pies with maple cream cheese frosting last night that a friend brought over, and they were so good I vowed to make my own ASAP. Maybe I will give these ones a try! The thought of not finding a jar of peanut butter when I return stateside makes me shutter! As for pumpkin, there are some good gourd substitutes. Have you tried a potimarron? Smaller, but packs a lot of flavor. Oh, don’t worry! Only one of my favorite brands was taken off the shelves, because it uses Valencia peanuts. There will be plenty of PB, it just might be more expensive.